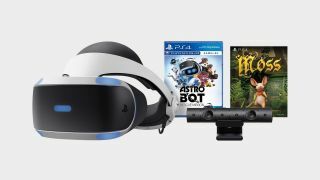 This PlayStation VR Astro Bot Rescue Mission & Moss Bundle is some kind of unicorn: it's a hardware bundle that comes with a VR headset, a camera (which is required), and arguably the two best games for the entire platform, all for a third of the normal price. The bundle is such a limited-time good bargain that it's sold out on Amazon and Walmart as of this writing, but you can still pick it up for $199 on Newegg. Sure, you'll need a PS4 or PS4 Pro to be able to play, but you can find plenty of deals on those too amongst all our Black Friday game deals. Astro Bot Rescue Mission is a 3D platformer in the vein of games like Super Mario Odyssey, and it uses the VR headset to put you in the world as a benevolent guide for the eponymous remote-controlled robot. You'll need to look all around you to find hidden passages and items, and even use your controller as an in-game tool to clear the way for your 'bot buddy. Moss is a more grounded but no less adorable action-adventure game about a tiny mouse named Quill on a grand adventure; you'll feel like you're guiding her around actual mouse-sized nature dioramas as you play. The bundle also comes with the PlayStation VR Demo Disc 2, which includes little snippets of a dozen games (definitely try the Thumper demo) and, like any PSVR owner, you're free to download and install The Playroom VR for a party-friendly selection of minigames. If I sound excited, it's probably because I bought the bundle myself! It was my first Black Friday 2018 purchase and I don't regret it one bit. Make sure you check out our guide to PlayStation VR bundles for even more options.